Bands: in the case of this particular pair, the male is banded (silver band on the right leg, black over red band on the left) while the female is not. When a bird is standing or perched with its legs exposed, this quick check can be used to confirm the identity of the bird. 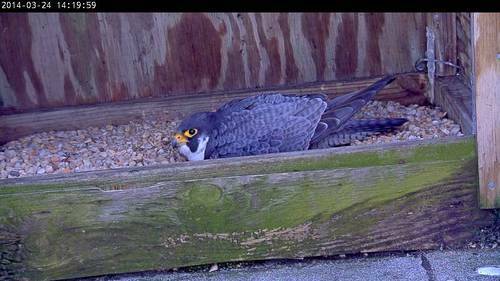 Size: as is the case with other raptors, female peregrines are larger than males, averaging 15% greater size. 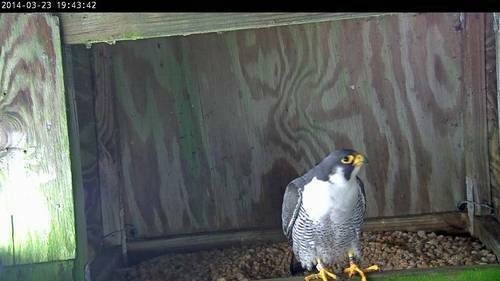 Although this size difference is obvious when both birds are seen together (as during an incubation exchange at the nest box), it is not as reliable when only one bird is on camera. Plumage: male peregrine falcons generally have a whiter, brighter breast than females, whereas females tend to show more buffy coloration on their underparts. This is indeed the case with this particular pair, with the female showing extensive buff on the lower breast and belly and the male showing no traces of buff in its plumage. 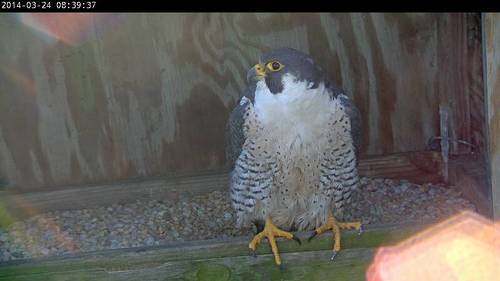 This male also has very striking, well-pronounced and quite obvious dark barring extending from the breast onto the belly. In contrast, horizontal barring on this female is less-pronounced, being much more scattered and spotty in the belly area. 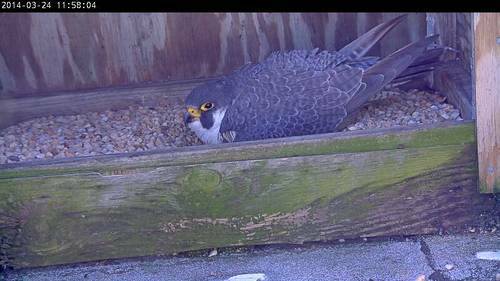 These differences in plumage may not always be detectable when the birds are in incubating posture and their underparts are not fully visible. 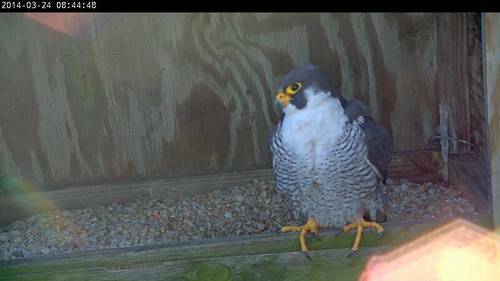 However, like many female peregrines, the Richmond female has a brown tinge to portions of her dorsal parts, whereas the male has much more of a bluish appearance. These differences may be subtle depending on posture and lighting conditions, but can provide yet another clue to the identity of the bird on camera.